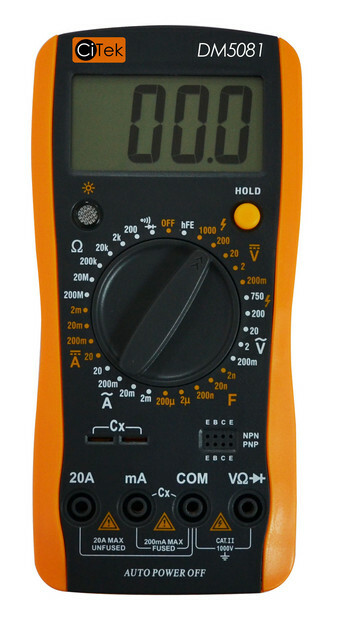 The Citek DM5081 is easy to operate ,accuracy ,compact, rugged, battery operated, handheld 3½ digital multi-meter for measuring DC and AC voltage, DC and AC current, Resistance and Diode, Capacitor, Transistor(hFE), Continuity Test and Temperature or frequency. The Dual slope A-D Converter uses C-MOS technology for auto-zeroing, polarity selection and over-range indication. It also has full overload protection.The Citek DM5081 is an ideal instrument for use in the field, laboratory, workshop, Industrial maintenance, DIYers and home applications. • Single 30 position easy to use rotary switch for FUNCTION and RANGE selection. • Dual slope A-D Converter uses C-MOS technology. Yes, keeping idle for about 15min.